According to his Twitter timeline, this social media professional had 3 ghostwriters on staff until yesterday, when he let one go. I’m sure, to his chagrin, he didn’t change his Twitter password. The result is something highly unprofessional, but something that could happen to anyone of us as a result of a momentary oversight. Those of us who have ever lost a job can probably relate to the feelings expressed by this ghostwriter towards his former employer. However, all that would have to happen is for Mark to name this unemployed writer, and we can be certain the writer would remain that way for a long time to come! So, don’ttake your momentary anger and make it part of the permanent record of the internet! There are multiple lessons to be learned here. If you’re an employer and let an employ go, make sure that your systems remain secure. If you’re recently unemployed, find other, more constructive, means of dealing with the feelings you’re experiencing. The loss of an income is significant. You have every right to feel intense emotions about it. But don’t let those emotions blind your reason and drive you to irreparable actions. If you’ve been the victim of a hacked account or some other kind of business failure, consider what information you want to share with your connections. How do you want people to view you afterward? Tailor your response to that. Is there something you could have done to prevent the issue? Own up to it. Anyone can take their ball and go home. However, professionals face their problems, acknowledge what went wrong and what’s being done to fix the issues, and they move forward from there. 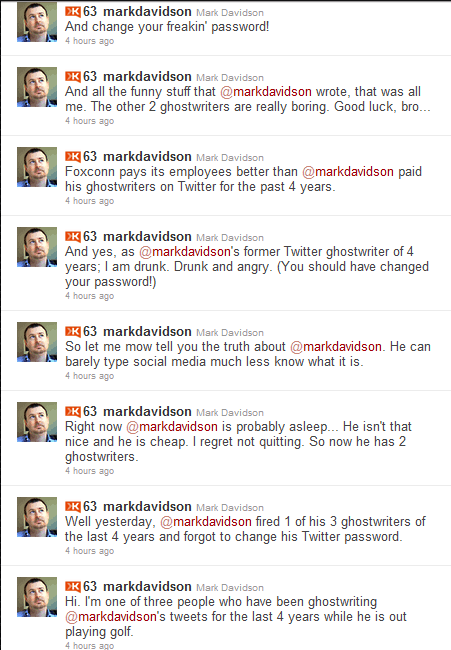 Mark’s subsequent tweets show that he considered giving up; but instead, he posted a want ad for a new ghost writer. Know anyone that’s interested?